What does “influencer marketing” mean to you? Are you thinking of celebrities posting product photos to Instagram? Or having a famous YouTuber run a contest for a meet and greet at an event? Why not send products to bloggers in the hopes that they’ll do a review and say nice things? Surely that’s not all enterprise marketers think of when it comes to the possible outcomes with influencer relationships. The promise of brands collaborating or outright paying influential individuals to create content that lifts the brand’s credibility and reach to sell more products is something that companies of all sizes have been hot on – especially in the past 12 months. With a groundswell of interest, there are many divergent interpretations of what influencer marketing really means. With so many different opinions, best practices and even definitions, my agency TopRank Marketing, set out with influencer marketing platform Traackr to bring clarity and future direction by conducting research into the practice for large, enterprise organizations. We also engaged my pal and respected futurist, author and analyst, Brian Solis of Altimeter Group to conduct an analysis of that research and write a report outlining what is working, what isn’t and future trends. The result is something I am very proud to be a part of. Influence 2.0: The Future of Influencer Marketing. In this elegantly designed report, Brian outlines an argument for evolving influencer marketing to influencer relations, or Influence 2.0. Brands need to evolve their view of influencer marketing from short term transactional engagements to a more strategic and holistic view that emphasizes long term influencer relationships. He also discusses the digital transformation of marketing, the importance for brands to humanize their marketing and the role of influence with customer experience. Of course he covers the role of content within influencer marketing and makes predictions for the future too. While this report is geared towards senior enterprise level marketers, it also includes 10 steps for setting the foundation of an Influence 2.0 approach that I think practitioners at companies of all sizes will find valuable. The icing on the cake to this report are the quotes and case studies from marketing influencers, many of which are clients of our agency, that I respect greatly including: Ted Rubin, Amanda Duncan (Microsoft), Dr. Konstanze Brown (Dell), Amisha Gandhi (SAP), Ann Handley (MarketingProfs), Jon Miller (Engagio), Jason Miller (LinkedIn) and more. Working on this project with the teams at Traackr and Altimeter has been an incredibly satisfying journey as we surveyed over 100 enterprise level marketers and brand strategists from companies including Microsoft, American Express and 3M. What we found is compelling and cause for even more optimism around influencer marketing – especially for those brands that approach the practice strategically, holistically and with the right resources. Here are 7 of the key trends in the report that will help point marketers in the right direction for realizing true ROI and business impact in 2017. 1. 71% of marketers say their influencer marketing programs are strategic or highly strategic. At the same time, on average, enterprise companies are allocating only a 10% share of marketing budget to influencer marketing. In fact, 50% of the CMOs we surveyed allocate less than $100,000 annually. Clearly, enterprise companies need to put their money where their strategy is. The good news is that 55% of marketers surveyed plan to spend more on influencer marketing in the coming year and for those that spend more than $250,000 annually, that number jumps to 67% and even higher to 77% for those brands using influencer marketing technology. 2. 67% of marketers want to drive lead generation through the use of influencer marketing. Beyond improving brand advocacy, awareness and reaching new audiences, the majority of marketers are also focused on improving leads and sales conversion (74%) as a result of working with industry influencers. Thinking holistically, influence plays a role throughout the customer lifecycle and in all relationship-drive brand communications. The movement towards brands incorporating influencers in content beyond marketing to sales, customer service, recruiting and PR is gaining momentum. 3. 80% of marketers rate content marketing as most impacted by influencer marketing. In discussions about the ROI of brand relationships with influencers, there’s simply no better match than content collaboration for creating measurable, impactful business outcomes. The research supports this with content being rated highest in impact from influencer marketing along with social media marketing and media relations. 4. 43% of marketers are experimenting with influencer marketing. It is still early days for influencer marketing within companies with such a large number still experimenting. 28% of marketers rate the maturity of their influencer marketing program as campaign driven and 24% are implementing ongoing programs. As brands mature their ability and relationships with influencer marketing, I think the trend will change significantly towards the majority of companies implementing always on, ongoing programs. 5. 48% of B2C influencer marketing programs are ongoing. This is in contrast to only 11% of B2B companies running ongoing influencer marketing programs. With 80% of marketers rating content so important in terms of influencer marketing impact and the importance of content for longer B2B sales journeys, I think we’ll see explosive growth of ongoing programs in the B2B space. 6. Marketing owns influencer marketing (70%) but PR engages with influencers most often (70%). There is, what seems, an eternal battle between who owns influencer marketing and rather than a turf war, I think what we’ll see more of is convergence between marketing and PR. The same influencers could be engaged by multiple departments within an organization beyond marketing and PR, so a more holistic and strategic view along with the right technology for management of those influencer relationships will be essential. 7. 57% of marketers say influencer marketing will be integrated in all marketing activities in the next 3 years. Currently, only 5% of marketers rate the maturity of their influencer marketing program as integrated, so the forward looking optimism for the next 3 years towards integration should be a strong signal for the direction influencer marketing is going. In the Influence 2.0 model, influencers can play a role in each moment of truth during the customer journey through content, engagement and community. A strategic and always on approach to influence enables true customer centricity by placing customer experience at the center of an enterprise business strategy. It is by engaging influencers in authentic, long-term relationships and creating value within the relationships between influencers and their communities, that CMOs can impact sales, satisfaction, retention and overall customer experience. This report dives deep into each of these areas and represents a real evolution of the influencer marketing practice. A big thanks to Delphine Reynaud and the team at Traackr for all their hard work on this research project and report from the planning to the initial analysis to the beautiful design. 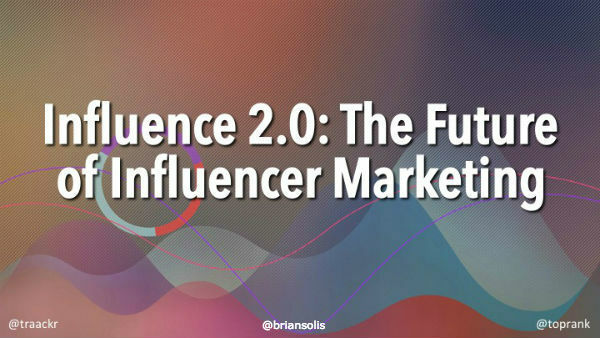 Also, a big thanks goes to Brian Solis for his insight and intelligence around the future of influencer relations – Influence 2.0. 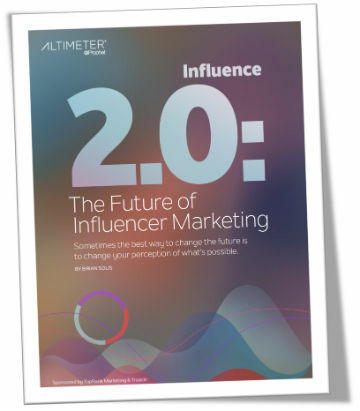 You can download the full Influence 2.0: The Future of Influencer Marketing report here. 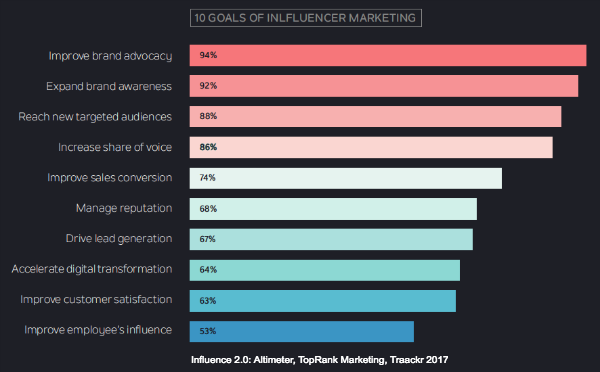 If you need help developing your influencer marketing strategy, finding the right influencers and integrating influencers with your digital marketing mix, check out TopRank Marketing content and influencer marketing services here. Our experience is that people engage way more with people than with brands. With this in mind, in B2B, we recommend “thought leadership” programs (i.e execs and evangelists engaging with the influencers) over “influencer marketing” (brand or PR or worse, agencies engaging with influencers). More long lasting results and authenticity in the relationships. Thanks Dominic. We actually see a mix of interactions. Of course for thought leadership programs it makes sense for B2B brand execs to engage with influencers. At the same time it does not make sense for execs to drive influencer content collaboration. Also, agencies like ours have relationships with influencers the brands do not. We make introductions, facilitate collaboration and help evolve new brand and influencer relationships. I also think that influencer marketing will be more and more integrated in all marketing activities in the upcoming period, Lee. Hey Lee. Thanks for these amazing insights. I can’t wait to implement them into my future posts about influencer marketing. I’m especially intrigued by the last trend, which states that a majority of marketers believe that influencer marketing will be integrated into all marketing activities within the next 3 years. That suggests that more and more businesses are starting to realize the value of this marketing channel. That’s it exactly Shane, thanks.